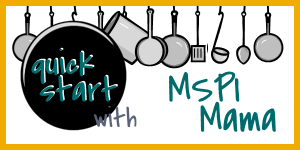 I am so excited to introduce you to “Quick Start with MSPI Mama”! I know how mind-numbing and awful those first few weeks on the MSPI diet can be for a mom. Trust me, I’ve been there. Not only are you dealing with the usual newborn baby problems of learning to nurse, crying, sleep deprivation and exhaustion, but you have the added issues of your baby’s MSPI symptoms, such as colicky behavior, reflux and even more sleep deprivation. And, oh yeah, you’re supposed to start a brand new diet that’s kind of complicated and filled with tons of label reading. You are literally petrified to eat ANYTHING because you don’t want your baby’s symptoms to get worse. Hello, rock bottom! I get so many SOS emails from mamas begging for advice, and I honestly don’t know what to tell you other than: “Hang in there! You can do it!” Well, I’m hoping “Quick Start with MSPI Mama” will go a long way in helping you ladies. Every ingredient is completely free of dairy and soy. Yup, that even includes soy oil and lecithin. There are lots of fresh, whole ingredients, and you’ll occasionally see canned ingredients. None of the ingredients are “specialty ingredients.” In other words, there’s no rice milk, because that’s not something you see in your average kitchen. And you won’t see anything labeled “MSPI-friendly.” All the ingredients in these recipes are naturally MSPI-friendly and you shouldn’t have any worries about using them. For example, you won’t see Worcestershire sauce listed in one of these recipes, even though it’s pretty easy to find Worcestershire that’s MSPI-friendly. Basically, I’m trying to make the MSPI diet as easy as possible. The idea is that once you’ve mastered the basics of the MSPI diet and label reading you can move on to my other recipes that have more “complicated” ingredients and start adapting your own recipes. Now this doesn’t mean you shouldn’t read labels. ALWAYS read labels! You have to familiarize yourself with the process. And this doesn’t mean mistakes can’t be made, especially if you are completely avoiding soy oil and lecithin. They are sneaky little buggers! And cross-contamination is always possible. You are still ultimately responsible for the food you choose to eat, but I hope “Quick Start” will make the process a little bit easier. Woop! Woop!! This is awesome! As I am currently wading my way through the second child with a gassy gut, I am in love with this. And, if we have yet another down the road, I will revisit this immediately. Here's a question for you... did you do the diet while you were pregnant? Thank you so very much. Seriously, I don't really know what I would do without your website. My "summer diet" seemed easier, as I could grill just about anything, but I am having a hard time cooking indoors now that fall is around the corner. (I am usually a crockpot gal!) My son is also allergic to tomatoes, which throws a major wrench into my diet. YUCK. Anyway, I just wanted you to know that I am very grateful for all of your knowledge and dedication. I am ALWAYS hungry and am hoping to find alot of recipes!